2 Combine Hellmann's® or Best Foods® Real Mayonnaise, soup, mushrooms and chicken in large bowl. 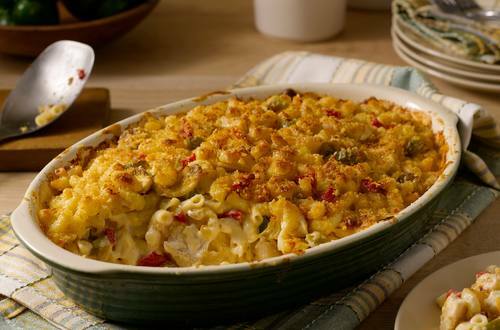 Stir in remaining ingredients except macaroni and cracker crumbs. Stir in macaroni. Turn into 13 x 9-inch baking dish, then evenly top with cracker crumbs. Bake 30 minutes or until bubbling.